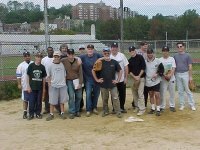 "Softball For The Love Of It" is a pick-up softball league in New York City in which I have long been privileged to be a participant. It is composed of about 60 players ranging widely in age, ability, and attitude (and wardrobe), but all sharing a devotion to the beloved game of softball. We divide up those hardy souls who show up on a given weekend morning into two matched teams. We play the majority of our games at the beautifully restored Heckscher Fields in Central Park at 63rd Street (the field closest to the Carousel), Riverside Park, the Dobbs Ferry Little League field, Zinsser Park in Hastings-on-Hudson, and Van Cortlandt Park. Our season usually runs from March or early April to late November, with either excellent or poor weather either increasing or decreasing that period. We are always interested in hearing from any "new blood" that shares our enthusiasm for the sport. Many have found this website and contacted me to express their interest; we in turn will advise them if and when turnout during the season allows us to dip into this much-appreciated source of new talent. We have some unique ground rules. Perhaps the most controversial is the "Tree Rule," a guideline which purportedly traces back to the Druids (also known for their aversion to aluminum bats), which provides that trees and other manifestations of nature (as opposed to person-made structures like fences) are, in essence, "heavy air," such that batted balls which strike them and land in fair territory, are in play. Thus, a batted ball which hits a tree or appurtenances thereto (such as leaves) and is caught before hitting the ground (the ball, that is) constitutes an out. Unauthorized sudden planting of trees by players during a game within the field of play for strategic advantage is forbidden. The "Tree Rule" was modified in a specific situation involving home runs. Click here for my article on Pick-Up Softball from the New York Observer.